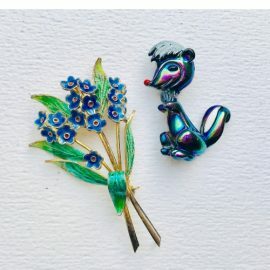 Pins and brooches have been an accessory mainstay for centuries and for good reason - utilized fully, these gems can be some of the most versatile bang for your buck in your accessories armoire. 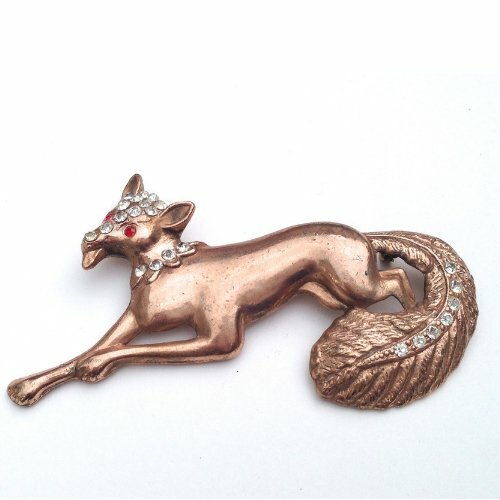 Vintage brooches especially add a unique flair to an ordinary outfit in a myriad of ways. Gone are the days of only wearing a brooch on your coat lapel when there are so many other possibilities! In your hair! Attached to a ponytail holder, plain headband, hair clip, or even a hat a brooch is a great way to finish your hairstyle creatively and easily. Define your waist! Whether using one statement brooch or a cluster of smaller pins, a brooch is a great way to change or highlight the waistline on an outfit, directly on the garment or on top of a belt. Down to your toes! As much as we love shoes, we can’t all have the perfect shoes for every outfit. Maximize your shoe wardrobe by pinning the perfect accent onto the straps, toe box, or vamp of your favorite pair. Put a ring on it! Wear a brooch as another piece of jewelry - pinned to a fabric bracelet, ring, or on a chain - what piece of jewelry could be more versatile? Button up! A brooch is ideal for quick fixes in addition to adding a little je ne sais quoi to an ensemble. Use a brooch as the closure on a jacket, to replace a hook and eye on a dress, zipper pull, to close a gaping blouse, even to secure a broken bracelet or necklace. Tie it in! A brooch is perfect for dressing up a scarf or keeping a shawl in place. Luxe Lapel! An oldie but goodie. If you are lacking inspiration for wearing a brooch on your shirt’s lapel, add it to your jacket or coat. An easy way to look polished, not to mention find your black winter coat in a pile at a party. “Change” Purse! Whether you want to accessorize your canvas shopper or create a more secure clasp on an open-top hobo handbag, brooches work on your bags too. A cluster of pins could even help you locate your suitcase at baggage claim. Convertible Clothing! Brooches give you more bang for your buck - create ruching on a basic tee, pin to the “V” of a neckline or draw attention to cleavage in a strapless dress, even change the neckline on a top by pinning the straps into a halter...the options are endless! These are just a few ideas to start incorporating vintage brooches into your modern wardrobe. This versatile vintage accessory can be found in any price range and is also be a great place to start your vintage collection. It’s important to experiment with different styles to find the brooches that are right for you. You may find that you prefer lighter or heavier, bigger or smaller, rhinestones or enamel. 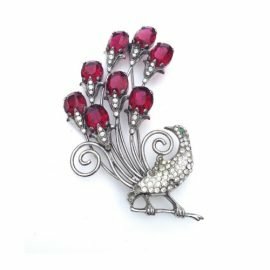 There is a style out there for everyone when it comes to vintage brooches and pins. In fact, there are often several - fair warning, it can become addictive! But with so many uses and timeless looks, this is one addiction you can afford to give in to. Shop for true vintage brooches, pins, and more from every era at the Chicago Vintage Clothing and Jewelry Show on Friday Oct 4th and Saturday Oct 5th 2019 at St. Andrews Greek Orthodox Church at 5649 N. Sheridan Rd, Chicago.